A Swiss guy has been selling the later versions of the US Military quartz watch Adanac I talked about last week. I have one from 1986 but I can not recommend them highly enough from any year as a 'go to' beater... well worth the cash. "Eagle-eye Al'" strikes again. Anyone thinking about buying one of these Adanacs on ebay might want to check their hands though as they look like they are tritium tubes, rather than those shown in the photo in Al's post above. Check the second hand too as there were different types. I have not had a chance to see whether they were issued with "non-tube" dials and "tube" hands but I suppose the later "tube" hands could have been added when the watches were refurbished later on in their service life. 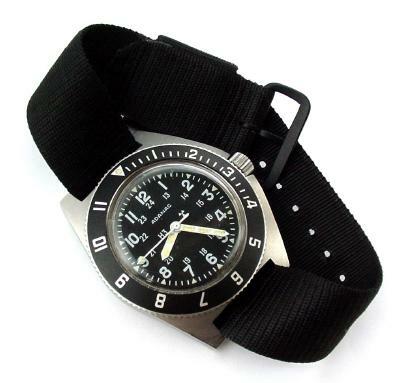 These asymmetrical case watches are a must for any military collection - I have a Benrus Type II which sees a lot of use. Though I tend to lean toward automatics, I can absolutely see that as a day to day beater, though on Ebay US they seem horribly overpriced. Like one of my favorites, Enicar (Racine spelled backward) Marathon chose to brand this one with mirror writing.